GIP(3-30)NH2 is a potent competitive antagonist of the GIP receptor and effectively inhibits GIP-mediated insulin, glucagon, and somatostation release. Alternative processing of the precursor protein pro-GIP results in endogenously produced GIP(1-30)NH2, that by DPP-4 cleavage in vivo results in the metabolite GIP(3-30)NH2. We showed previously that GIP(3-30)NH2 is a high affinity antagonist of the human GIPR in vitro. Here we determine whether it is suitable for studies of GIP physiology in rats since effects of GIP agonists and antagonists are strictly species-dependent. Transiently transfected COS-7 cells were assessed for cAMP accumulation upon ligand stimulation or assayed in competition binding using human 125I-GIP(1-42) as radioligand. In isolated perfused rat pancreata insulin, glucagon, and somatostatin-releasing properties were evaluated. 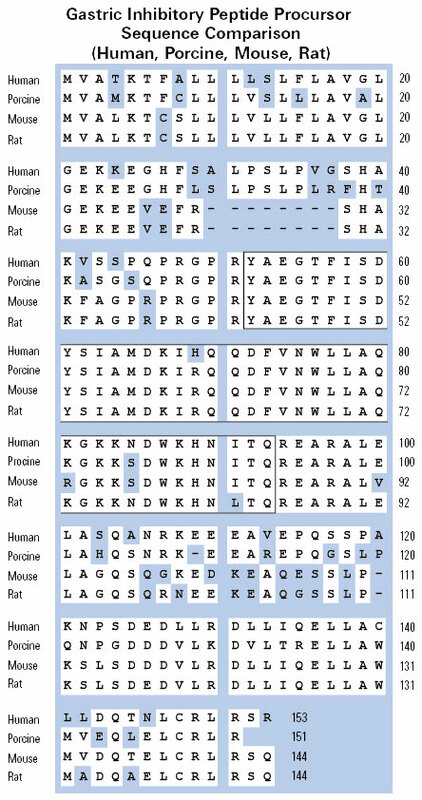 Competition binding demonstrated that on the rat GIP receptor (GIPR), rat GIP(3-30)NH2 bound with high affinity (Ki of 17 nM), in contrast to human GIP(3-30)NH2 (Ki of 250 nM). In cAMP studies, rat GIP(3-30)NH2inhibited GIP(1-42)-induced rat GIPR activation and schild-plot analysis showed competitive antagonism with a pA2 of 13 nM and a slope of 0.9±0.09. Alone, rat GIP(3-30)NH2 displayed weak, low-potent partial agonistic properties (EC50>1µM) with an efficacy of 9.4% at 0.32 µM compared to GIP(1-42). In perfused rat pancreata, rat GIP(3-30)NH2 efficiently antagonized rat GIP(1-42)-induced insulin, somatostatin, and glucagon secretion. In summary, rat GIP(3-30)NH2 is a high affinity competitive GIPR antagonist and effectively antagonizes GIP-mediated G protein-signaling as well as pancreatic hormone release, while human GIP(3-30)NH2, despite a difference of only one amino acid between the two (arginine in position 18 in rat GIP(3-30)NH2; histidine in human), is unsuitable in the rat system. This underlines the importance of species differenes in the GIP system, and the limitations of testing human peptides in rodent systems. Glucose-dependent insulinotropic polypeptide is expressed in pancreatic islet alpha-cells and promotes insulin secretion. BACKGROUND & AIMS: Glucose-dependent insulinotropic polypeptide (GIP) and the proglucagon product glucagon-like peptide-1 (GLP-1) are gastrointestinal hormones that are released in response to nutrient intake and promote insulin secretion. Interestingly, a subset of enteroendocrine cells express both GIP and GLP-1. We sought to determine whether GIP also might be co-expressed with proglucagon in pancreatic alpha-cells. METHODS: We assessed GIP expression via reverse-transcription polymerase chain reaction, in situ hybridization, and immunohistochemistry. We developed a novel bioassay to measure GIP release from isolated islets, compared the biological activities of full-length and truncated GIP, and assessed the impact of immunoneutralization of islet GIP on glucose-stimulated insulin secretion in isolated islets. RESULTS: GIP messenger RNA was present in mouse islets; GIP protein localized to islet alpha-cells of mouse, human, and snake pancreas, based on immunohistochemical analyses. However, using a C-terminal GIP antibody, immunoreactivity was detected in islets from prohormone convertase (PC) 2 knockout but not wild-type mice. Bioactive GIP was secreted from mouse and human islets after arginine stimulation. In the perfused mouse pancreas, GIP(1-42) and amidated GIP(1-30) had equipotent insulinotropic actions. Finally, immunoneutralization of GIP secreted by isolated islets decreased glucose-stimulated insulin secretion. CONCLUSIONS: GIP is expressed in and secreted from pancreatic islets; in alpha-cells, PC2 processes proGIP to yield a truncated but bioactive form of GIP that differs from the PC1/3-derived form from K-cells. Islet-derived GIP promotes islet glucose competence and also could support islet development and/or survival. Differential processing of pro-glucose-dependent insulinotropic polypeptide in gut. Glucose-dependent insulinotropic polypeptide (GIP) is a hormone released from enteroendocrine K cells in response to meals. Posttranslational processing of the precursor protein pro-GIP at residue 65 by proprotein convertase subtilisin/kexin type 1 (PC1/3) in gut K cells gives rise to the established 42-amino-acid form of GIP (GIP(1-42)). However, the pro-GIP peptide sequence contains a consensus cleavage site for PC2 at residues 52-55 and we identified PC2 immunoreactivity in a subset of K cells, suggesting the potential existence of a COOH-terminal truncated GIP isoform, GIP(1-30). Indeed a subset of mouse and human K cells display GIP immunoreactivity with GIP antibodies directed to the mid portion of the peptide, but not with a COOH-terminal-directed GIP antibody, indicative of the presence of a truncated form of GIP. This population of cells represents approximately 5-15% of the total GIP-immunoreactive cells in mice, depending on the region of intestine, and is virtually absent in mice lacking PC2. Amidated GIP(1-30) and GIP(1-42) have comparable potency at stimulating somatostatin release in the perfused mouse stomach. 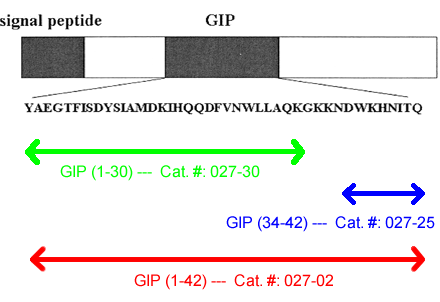 Therefore, GIP(1-30) represents a naturally occurring, biologically active form of GIP. Pancreatic and Extrapancreatic Effects of Gastric Inhibitory Polypeptide. The hormonal factor(s) implicated as transmitters of signals from the gut to pancreatic-cells is referred to as incretin, and gastric inhibitory polypeptide (GIP) is identified as one of the incretins. GIP is a gastrointestinal peptide hormone of 42 amino acids that is released from duodenal endocrine K-cells after absorption of glucose or fat and exerts its effects by binding to its specific receptor, the GIP receptor. By generating and characterizing mice with a targeted mutation of the GIP receptor gene, we have shown that GIP has not only an insulinotropic role, but also physiological roles on fat accumulation into adipose tissues and calcium accumulation into bone. We here propose a new acronym, GIP, for gut-derived nutrient-intake polypeptide.